Mirra 2 moves with you, at one with your body. When you sit, the seat and back adapt to you instantly. 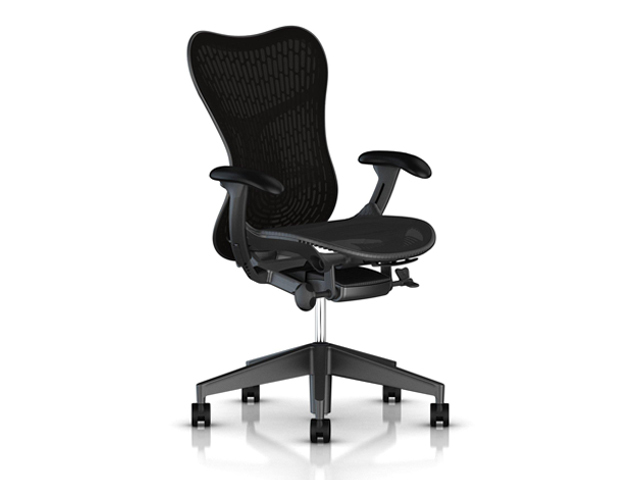 With dynamic surfaces that respond to your slightest movements and simple, intuitive adjustments to fine-tune the fit, this ergonomic office chair balances immediate comfort and personalised ergonomics in one sophisticated design. The designers at Studio 7.5 set out to create a high-performing ergonomic office chair that supports people who work in a constant state of motion. The result is Mirra 2, a leaner, lighter, sophisticated design with an athletic attitude and plenty of opportunities for personalisation. 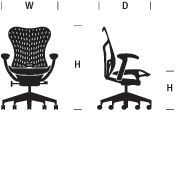 The office chair’s emphasis on performance is readily visible. 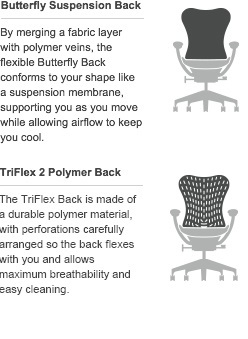 The Butterfly Back, a hybrid structure that merges a fabric layer with polymer veins, makes the chair more responsive, while bringing visual lightness to any environment. Ten years after the Mirra chair was introduced – during which over 1.5 million chairs had been sold – the designers at Studio 7.5 believed it was time to evaluate and, if necessary, rethink their original design. For one thing, they noted, work is evolving. People move, and the more they’re in motion, the more they need support that moves with them. Precisely because of the new agile way people work today, the designers found the idea of a highly individualised personal chair was still valid. While Studio 7.5 retained the athletic attitude and intuitive adjustments of the original, they advanced the material and form of this idea in virtually every aspect of Mirra 2. Building on its legacy as the first office chair developed from the ground up with environmental responsibility in mind, Mirra 2 moves responsible design forward by advancing the use and reuse of materials. In redesigning Mirra, as in all their work, the mantra at Studio 7.5 was “every molecule counts”. By this they mean a close examination of every element is essential in order to use the least material possible while also advancing performance. For normal cleaning, wash coated metal surfaces with a soft cloth soaked in detergent and warm water; rinse thoroughly and dry. Remove scuff marks from low-gloss coatings with pre-softened paste wax, following the manufacturer's instructions. Remove scuff marks and scratches from high-gloss coatings using automotive polishing compounds, either liquid or paste. After polishing, apply a pre-softened automotive paste wax to restore original sheen.